Game description: From the decade of big hair, excess, and pastel suits comes a story of one man's rise to the top of the criminal pile. 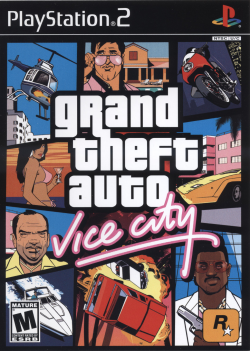 Vice City is a huge urban sprawl ranging from the beach to the swamps and the glitz to the ghetto, and is the most varied and complete digital city ever created. Combining nonlinear gameplay with a character driven narrative, you arrive in a town brimming with seedy opportunities and are given the chance to take it over as you choose. Take control of a variety of vehicles including high-performance cars and motorbikes, powerboats, golf buggies and helicopters. Browse through the radio stations, with styles ranging from rock to electro to find a sultry melody or pumping beat to suit your mood. No matter what type of man you are, Vice City is always full of surprises. Description: First loading bar takes a long time to finish or never finishes. Workaround: Has been fixed since at least PCSX2 v1.0.0. For even older versions place a copy of the SPU2-X plugin version 2.0.0 and up into the plugins folder of PCSX2. Then in PCSX2 go to Config > Plugin/BIOS Selector, and select the correct plugin at the SPU2 section. This page was last edited on 8 March 2019, at 06:42.